Order a copy of your transcript. Enjoy on and off campus discounts and rewards. Stay connected with a permanent Queen’s email address. Whether you need an official transcript for a job application, are interested in a variety of on- and off-campus rewards, or would like a permanent Queen’s email address, our alumni services have you covered. To request a transcript, please visit the Office of the Registrar’s ordering your transcript page or contact them via email. The Office of the University Registrar can also assist you with degree verification, replacement diplomas, SOLUS questions, and income tax certificates. Please contact the Registrar’s Office if you have forgotten your student number. Visit the services for alumni page on their website for more information or call (613) 533-2040. Keep your Queen’s connections alive with a permanent Queen’s email address. 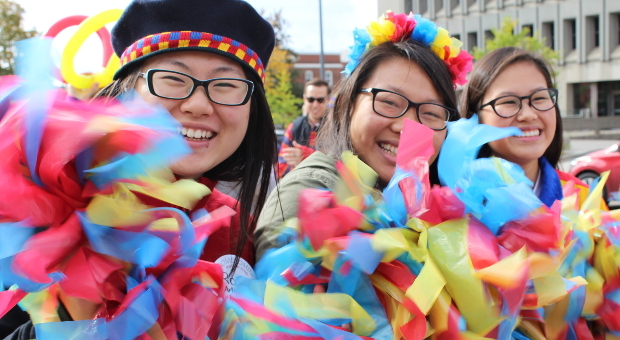 As alumni, you can sign up for a permanent @queensu.ca email address. For recent graduates (2013 and beyond) your student email automatically converts to a permanent email address. To keep your email service active, you must log into your account at least once per year. If you are only using your Queen's email account to forward mail to another address, then you will still need to log in to avoid loss of service. For other alumni, you will need to reactivate your NetID to gain access to Alumni Email for Life. Instructions for reactivating your NETID. Once your NetID is activated, you can log into Office 365 at this link. If you have completed the setup process and have issues with the activation/authentication process, please email to have us manually activate your email address. Please contact the Alumni Office if you have any questions. We no longer offer the Tricolour Email Forwarding to new users, however, we will continue to support the service for current users for the foreseeable future. You may wish to switch to the @queensu.ca email available for Queen's alumni. If you are using the forwarding service and would like to update your email address please email us. Do you have a @queensu.ca email address? As part of Queen's ongoing security initiatives, the Microsoft Advanced Threat Protection Safe Links feature has been enabled on all @queensu.ca email addresses as of June 8, 2017. Safe Links can help protect you from malicious hyperlinks in an email. This feature rewrites every URL link found in an email in order to redirect users through a Microsoft proxy server which checks at the time of click if the URL link is safe. Learn more about Safe Links. Enjoy access to campus venues, plus cash rewards and discounts at a wide number of affiliated partners when you use your personalized Queen’s Alumni Card. Free to all alumni. Register for your Alumni Card today. Access on-campus events during Homecoming, including access to on-campus pubs, Clark Hall Pub and The Underground. Discounted membership to Queen’s Library. Note: Queen’s is unable to offer off-campus access to electronic resources (including journals) to alumni. The licenses that govern access to electronic resources stipulate they are only for use by current members of the Queen’s community, which does not extend to alumni. Discounted alumni rates to the Queen’s Athletics & Recreation Centre with its state-of-the-art facilities. Enjoy all casual recreation activities and a select number of fitness and wellness programs. The University Club at Queen's. Upon graduation, alumni are eligible for a free one-year membership. MyCareer. Upon graduation, alumni will have continued access for one year to Queen's Career Services. Head west — or east — with VIA Rail Canada and save 15 per cent on all fares. Present your Alumni Card at the VIA Rail counter, or book your tickets online. *PLEASE NOTE: As a result of changing market conditions, VIA Rail Canada Inc. has recently revised its national pricing structure and implemented a strategic repositioning plan. Effective July 5, 2016, corporate discounts will no longer apply to Escape Fares. Queen's corporate discount still applies to all other Economy and Business Class fares so you can continue to enjoy all of the advantages of travelling by train. Use your Queen's Alumni Card number to register for the TruCash Rewards Program, a loyalty program that rewards you every time you shop. Upon registering, you will be able to login to access the TruCash site and watch your earnings grow. Register for your Alumni Card and receive your discount code for SoftMoc. Swipe your card in store, or use your discount code online to enjoy 10 per cent off all regular- and sale-priced merchandise. May not be combined with another discount offer and is not valid at the Whitby Warehouse Sale Outlet. Register at SoftMoc for further discounts with the SoftMoc Frequent Buyer Program. StudioQ (Formerly Yearbook Designs) produces the annual Tricolour Yearbook. They also maintain a stock of older yearbooks which they will mail to alumni for the cost of shipping. Find more information about ordering a replacement. We are always looking for extra copies of the Tricolour Yearbook so if you are looking for a new home for yours, please email the alumni office. Information on official transcripts, including ordering, costs, and transcript legends, can be found on the Office of the University Registrar’s site. The Office of the University Registrar offers a diploma replacement service. Find more information at Diploma Replacement service. Experience Queen's University every time your mobile phone rings with an "Oil Thigh" ringtone. Take a look at your mobile device guide to find out which ringtone format will work best for your phone. Instructions and download details for the Oil Thigh Ringtone. 1) Click on the MP3 file and save to your preferred desktop computer. 2) Create an email and attach the saved MP3 file. 3) Send the email to your preferred email account on your phone. 3) Click on the MP3 email attachment using your phone and download to your ringtone folder. 2) Plug in your phone to your preferred desktop computer (if you have a phone media software helper, please follow instructions). 3) Drag and drop the file from your desktop computer to your phone ringtone folder. 1) Click on the MP4 file and save to your preferred desktop computer. 2) Plug in your iPhone to your preferred desktop computer. 3) Add the MP4 file to your iTunes library (it should automatically appear in your Ringtone folder). 4) Go to your devices folder for your iPhone and sync only the ringtone. 5) Within your iPhone select the general settings button and select the sounds option. 6) Select the ringtone button and pick the Oil Thigh from your custom ringtone field. If you have any questions or issues downloading our ringtone, please email us.